SOOP Founder Discusses Truth Versus “Truthiness” with Debra Pickett, Author of Newly Released "Reporting Lives"
Debra Pickett talks about her new novel "Reporting Lives," and how truth can be stranger than fiction, fiction can be stranger than truth, and why sometimes it’s hard to tell the difference. Writing a novel was a way to get at the truths that were most fascinating to me with some dramatic license to make them compelling enough – I hope! – that others might actually want to think about them, too. At a recent literary dinner event, SOOP Founder Wade Fransson caught up with author Debra Pickett, who discussed the various ways in which she – and all writers – can successfully mine truth and fiction from their personal histories when crafting stories. In “Reporting Lives,” Pickett tells the story of Sara Simone, a television journalist who lands a big assignment in the slums of Nairobi, Kenya. But she abandons her usual talent for playing up the “tragedy beat” for television audiences when suddenly jolted by questions of its greater morality and consequences. What follows is a tale of self-discovery and reinvention that plays out a world away from Simone’s Chicago home. There are some obvious parallels between author Pickett and protagonist Simone. Both are successful journalists from Chicago whose work leads them to Africa, where they undergo transformative crises of identity. But there are also many key differences between the two. The following snippets from the conversation between Fransson and Pickett explore the role of truth in fiction. Wade Fransson (WF): Tell me a little about how you ultimately chose this format – a kind of fusion between fact and fiction – to relate this clearly personal story. Debra Pickett (DP): As a journalist, writing a non-fiction book probably should have been my default, but, with limited opportunities to travel to Kenya and limited time to spend there – six trips, over about a two year period – I wasn’t totally confident in my ability to report and absorb information fully enough to really do justice to the people and place. And, while I might have done a memoir about my time there, I wanted to move beyond my own personal story to something larger. I was barely 30 years old when I started working on this project and, frankly, my own life experiences are not interesting enough to sustain a whole book. Writing a novel was a way to get at the truths that were most fascinating to me with some dramatic license to make them compelling enough – I hope! – that others might actually want to think about them, too. WF: How did you decide what facts from your own life to keep intact and which to alter in creating the character of Sara Simone? DP: Well, the first thing I did when I thought about her character was to make her tall. Because I’ve always wanted to be tall. So I began imagining this tall American reporter walking around in the Mathare Valley slum in Nairobi and how she’d stand out there, how that might feel to her. The rest of the book really grew around the first image in my head: Sara ducking out through the doorway of a tin-roofed shack and feeling just sick and overwhelmed by the place. WF: The noticeable gaps between some chapters left a few significant events to the imagination of the reader. Was this your deliberate literary choice, or a result of the editing process? DP: It was mostly the latter. My early drafts included every single thing I’d ever learned or felt while working in Kenya. Sometimes, it was painful for me to leave things out that were so clearly of significance in my own head. Fortunately, I worked with some great editors who helped me sort that out: story had to come first. If an element didn’t move Sara’s story forward, or explicitly deepen the themes I was exploring, we ultimately had to leave it out. WF: Did you find your writing influenced by the aspiration many writers have of seeing their work on the big screen, perhaps even before finishing the book? DP: I spent ten years working on this book so, truly, just seeing it in print is incredibly gratifying. 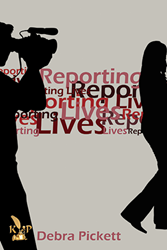 Of course I’d love to see “Reporting Lives” onscreen, but the main thing for me was always just telling the story and hoping that people might connect with it. WF: The references to "Zen and the Art of Motorcycle Maintenance" in your book seemed more meaningful than Sara let on. Did you consciously emulate, or avoid, the autobiographical nature of Pirsig’s book? DP: I last read Pirsig in high school, so, at this point, any influence is definitely unconscious. I will say, though, that, for me, an essay is about the most autobiography I could manage without being profoundly boring. Other people’s journeys are far more interesting to me. Something or Other Publishing, LLC is a new concept in publishing that seeks to connect authors and readers like never before. Its democratized selection process and subsequent focus on author education, empowerment, and encouragement is designed to provide a platform for a new generation of talented writers. The company is based in Madison, Wisconsin.